With the application Document Converter, you can realize many kinds of functions about document conversion, including converting document of html to dib. Document Converter is a professional document converter which enables you to convert any printable document to image formats only by some easy steps and in this article, you will see how to fulfill this conversion with the internal application of Document Converter. 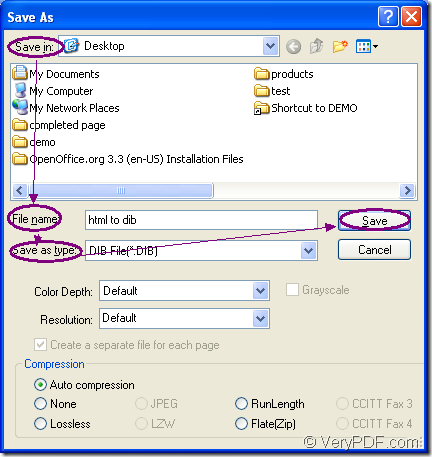 You should use the following website to download Document Converter: http://www.verypdf.com/artprint/docprint_pro_setup.exe. When you install it on your computer, you are able to see three applications. Two are located in the installation directory and one locates in the printer list. The applications in the installation directory are GUI application which can be used for batch conversion and the command line application which is a good helper to software developer. The application in the printer list is the virtual printer docPrint and docPrint PDF driver. docPrint will play the leading role in this article because it can not only act as a Windows printer but also a powerful document converter. You can use docPrint to convert any printable documents to various image formats and you can use docPrint to fulfill the conversion from html to dib within three steps. Please see the following contents for the conversion. You should open the HTML document and click “File”—“Print” to open the “Print” dialog box in which you can set “docPrint” as the current printer in “Printer” combo box and then please click on “OK” button. Of course, you can also use the hot key “Ctrl”+ “P” to open the “Print” dialog box. For your convenience, you can set docPrint as your default printer and you can run docPrint directly by right clicking the HTML document and clicking “Print” option. The second step is to open the “Save As” dialog box. In the popup docPrint main window, please click the “Save File” button or use the hot key “Ctrl”+ “S” for this purpose. You can also take the regular way—clicking “File”—“Save as” to open this dialog box. If you have some other good ideas, welcome to share with us. 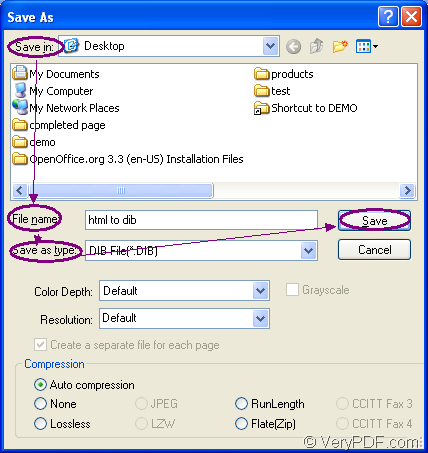 In the last step, you should save the document of html to dib image format in the “Save As” dialog box. Please see the dialog box in Figure1. The “Save in” combo box is able to make you choose a location for the target file. In “File name” edit box, please input the name for the target file. The “Save as type” combo box enables you to choose the right output format for the target file. At last, please click on “Save” button to save all the changes. For browsing the target file, you should choose one of the image viewing or image processing application and you can browse your target file when the conversion from html to dib is over. If you still have some questions about this conversion or Document Converter, please leave messages. Convert pcl to bitmap and rotate page via command line? How to convert URL to pdf using Document Converter?